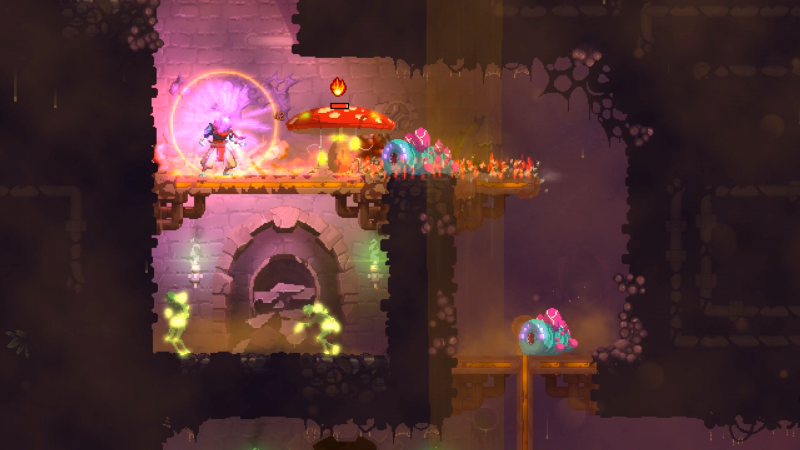 Dead Cells began as a Steam Early Access favorite, as the team at Motion Twin was heavily receptive to feedback, and the team looks to be doing that even post-release, as its latest update is filled with community suggestions. The latest update to the alpha branch of the game, which is currently available on PC, makes a number of major changes to the game. Cooldown reduction works very differently now, as players will now have to work to have their skill cooldowns reduced (by killing enemies, parrying, and landing critical hits) instead of receiving them for free. Enemies don't automatically scale to your level anymore, and bosses now drop a weapon and an active skill instead of legendary weapon, and the costs of weapons and items scale more quickly than your own income on higher difficulty. There are now also new kinds of challenge doors that need you to kill a number of enemies without getting hit to open and will offer rewards similar to those of timed doors, which now let players pick one of three rewards instead of simply giving a scroll. Among the number of balance, UI, and level changes, there's also a new custom mode, which allows players to run a game with specific parameters. You can modify which items are locked or unlocked, alter gameplay modifiers, and timers, among other things. For the full, extensive patch notes, head over here. As for when this update might be finalized and hit consoles, Motion Twin says it expects the update to "stay in alpha for quite some time while we tune the new balancing with your help."